Manufactured by degassed steel in vacuum furnaces, these rolls show high levels of pureness. They are forged in hydraulic presses in order to achieve high levels of toughness. 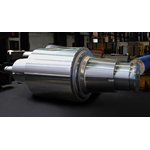 These rolls, used in continuous Hot Strip Mills, Steckel Mills and Cold Rolling Mills, are capable of facing the most severe rolling conditions. Our latest developments of Forged Back Up Rolls offer higher performances than Cast Back Up Rolls. The structural homogeneity of these products enables an increase in hardness, as well as a high level of resistance, guaranteeing higher performances in the mill.